EnvisioTEC is, by now, one of the most prominent names in DLP technology. The company has been showing around its new releases in trade-shows all throughout 2018. In 2019, they’ll be following up by launching their latest Envision One line cDLM (Continuous Digital Light Manufacturing) machines. The line will feature their end-to-end solution comprising brand new, easy-to-use design software and a lot more. The new line comes in two particular flavors: the Envision One cDLM Dental and the Envision One cDLM Mechanical. While they cater to two different industries, they have similar benefits and hardware. Both systems feature a 93 µm native XY resolution and a dynamic Z resolution ranging from 25 to 150 µm. Z resolution depends on the material being used but is impressive regardless. It also brings in EnvisionTEC’s Contour Gray Scaling technology, achieving 60 µm XY resolution capability in both systems. 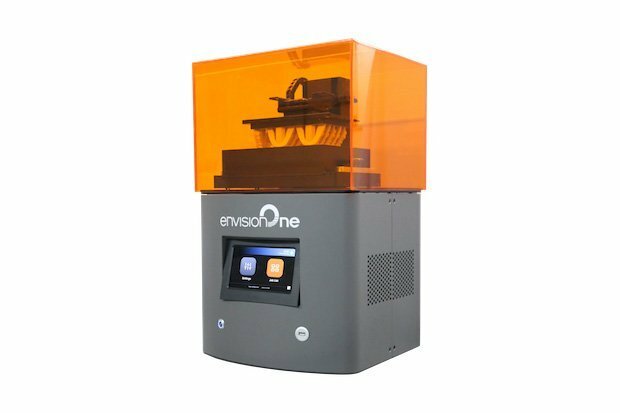 The Envision One line boasts the ability to print large, flat surfaces quickly with high accuracy and high reliability, something that many SLA and DLP machines often struggle with. They solved this particular issue by eliminating separation forces. The main difference between the two comes down to build envelope. The Dental model runs with a 180 x 101 x 85 mm, while the Mechanical adds a higher Z-height capability of 175 mm. The Envision One works at a rate of 50 mm per hour with 100 µm resolution. Additionally, both printers use a 385nm wavelength for higher accuracy. The shorter wavelengths reduce right reflection and give prints more consistency. These features come down to the Continuous Digital Light Manufacturing process. cDLM adds a layer of oxygen below a piece of oxygen-permeable film covering the build area. The permeable film allows oxygen to penetrate and create a dead zone on which to free-print. However, this has its own downsides. The presence of oxygen causes a mild dome effect, causing the print to manifest on a less flat surface. EnvisionTEC developed a material tray to compensate for this dome effect, thus controlling the pressure of oxygen. This way the build area experiences an even distribution of oxygen. The material tray thus allows the Envision One and other cDLM 3D printers to achieve that 1 µm accuracy in the Z direction. The tray has an average life of 250-300 jobs and is currently still patent-pending. EnvisionTEC have certainly worked out a lot of the kinks with light-based printing when it comes to the Envision One. It can operate without supports and generate various prints, such as orthodontics, within minutes. It’s also quite cheap considering the technology in use. Featured image courtesy of EnvisionTEC.